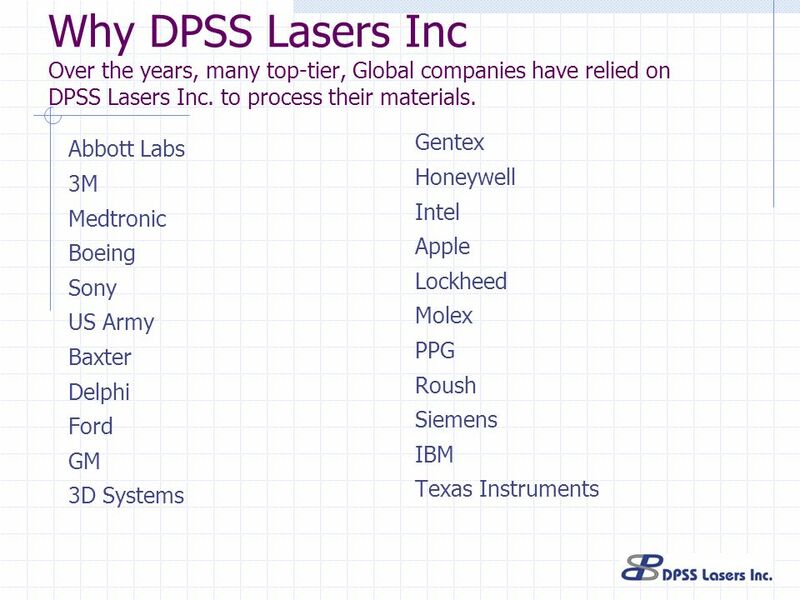 Since 1972, DPSS and our former company LiCONiX have been building UV laser systems. 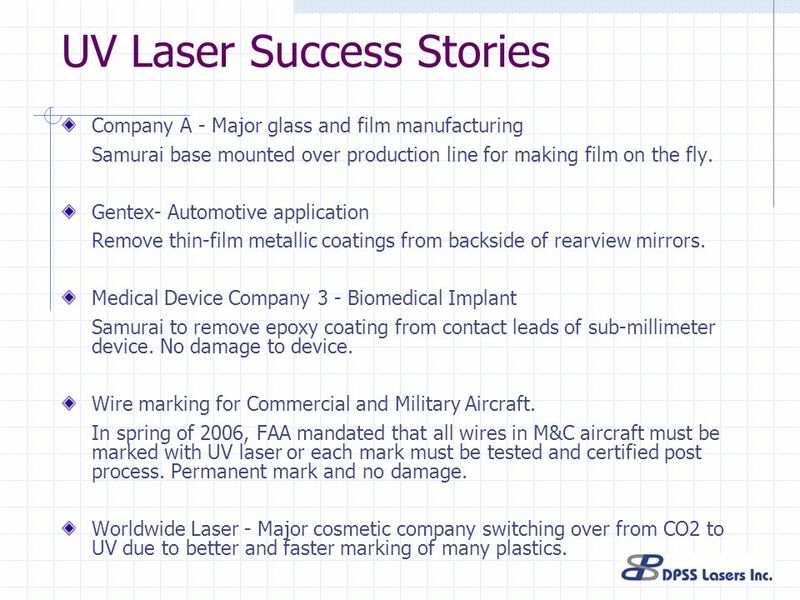 As LiCONiX, we delivered over 25,000 Blue and UV HeCd gas lasers. 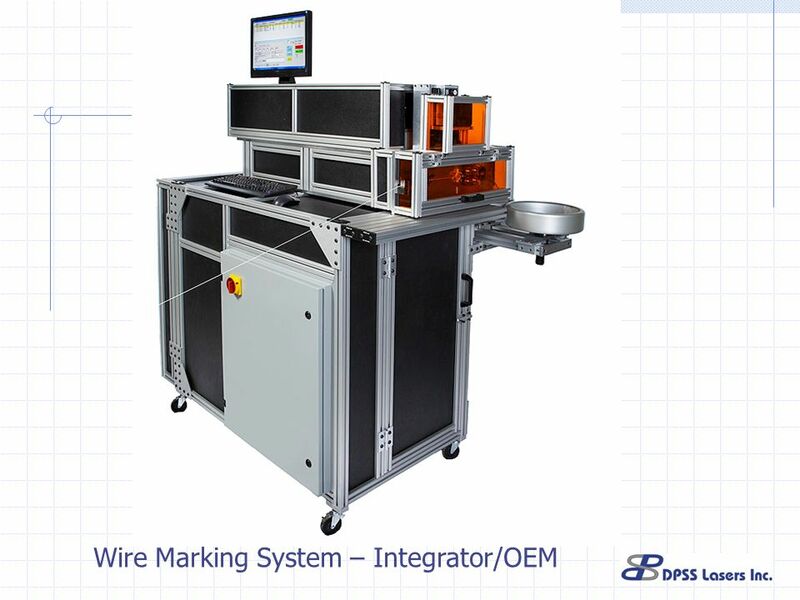 Sold LiCONiX’s gas laser group to Melles Griot in Spun-off the engineering and solid state laser group to form DPSS Lasers Inc. 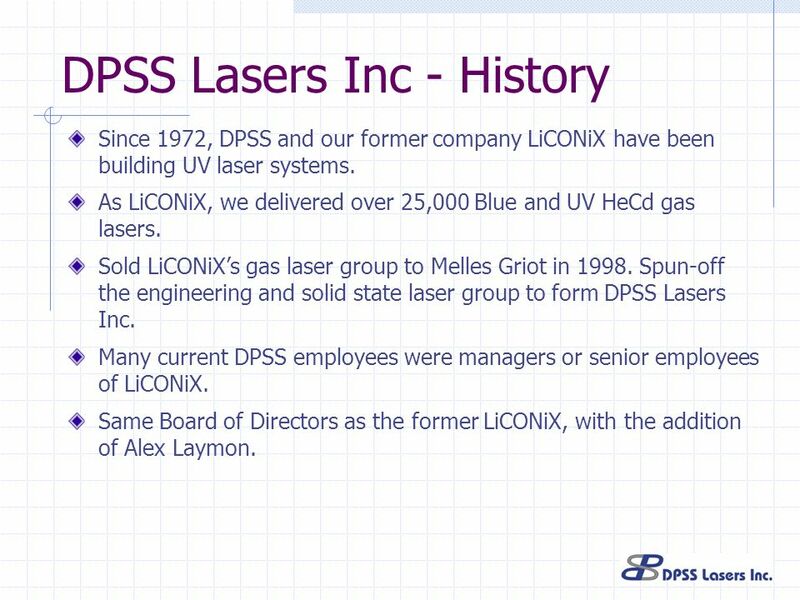 Many current DPSS employees were managers or senior employees of LiCONiX. 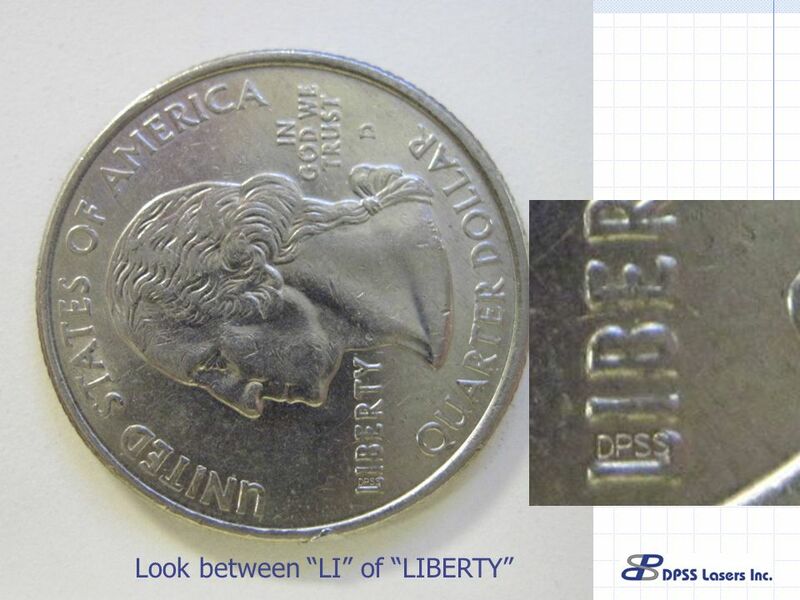 Same Board of Directors as the former LiCONiX, with the addition of Alex Laymon. 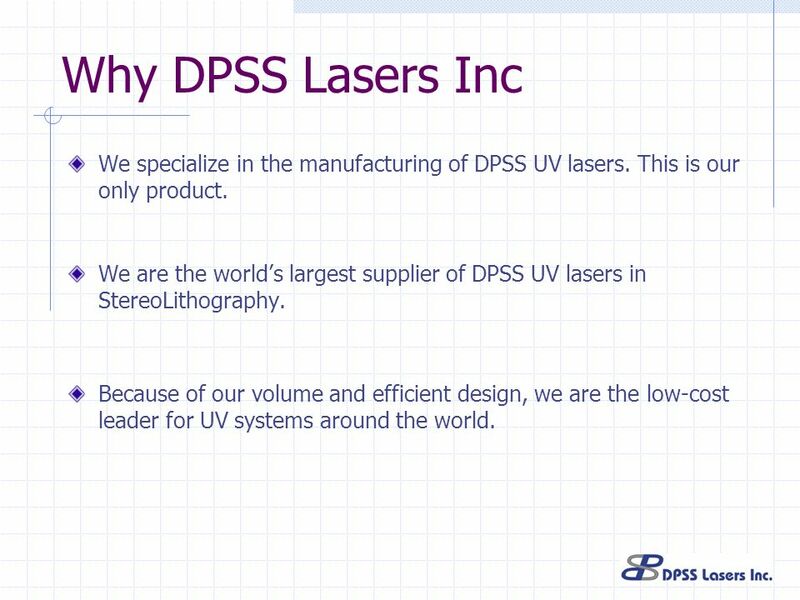 4 Why DPSS Lasers Inc We specialize in the manufacturing of DPSS UV lasers. 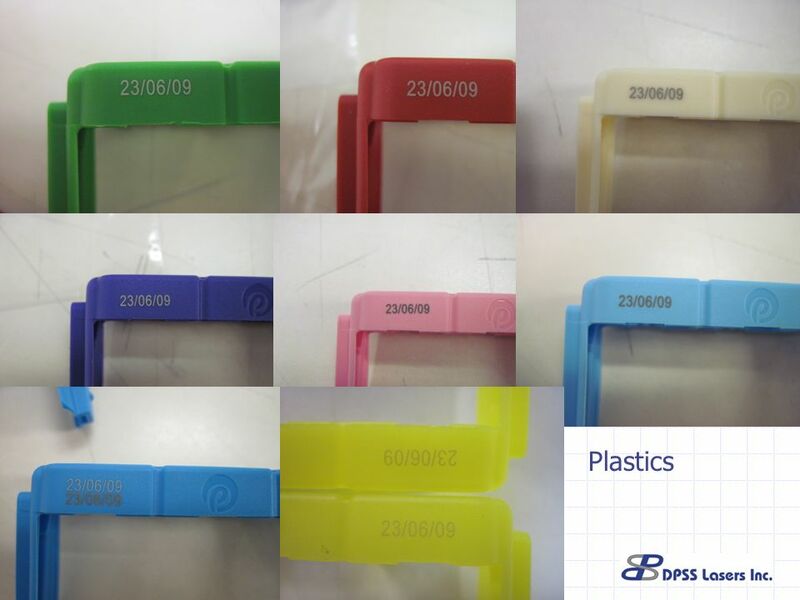 This is our only product. 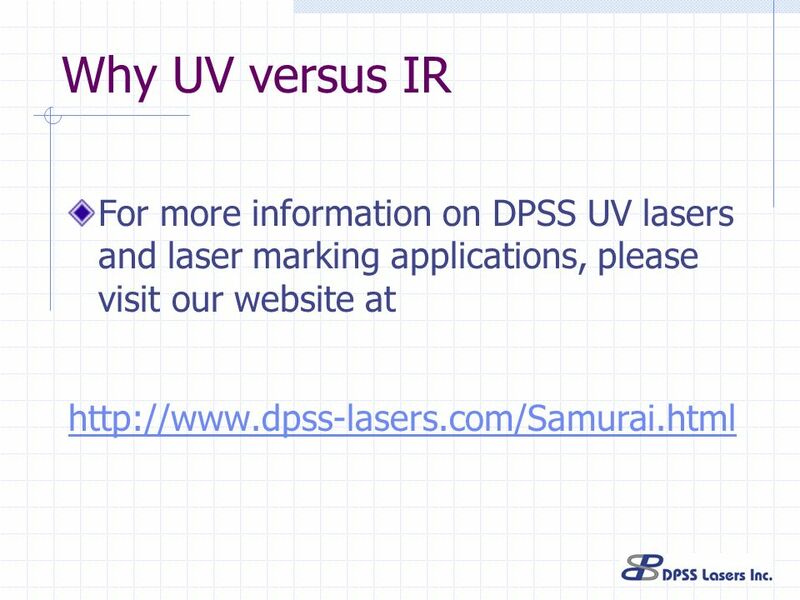 We are the world’s largest supplier of DPSS UV lasers in StereoLithography. 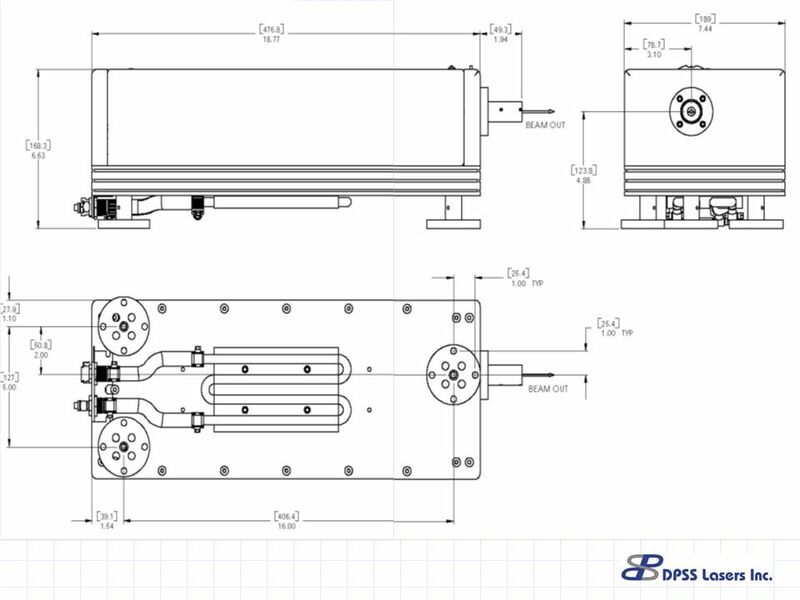 Because of our volume and efficient design, we are the low-cost leader for UV systems around the world. 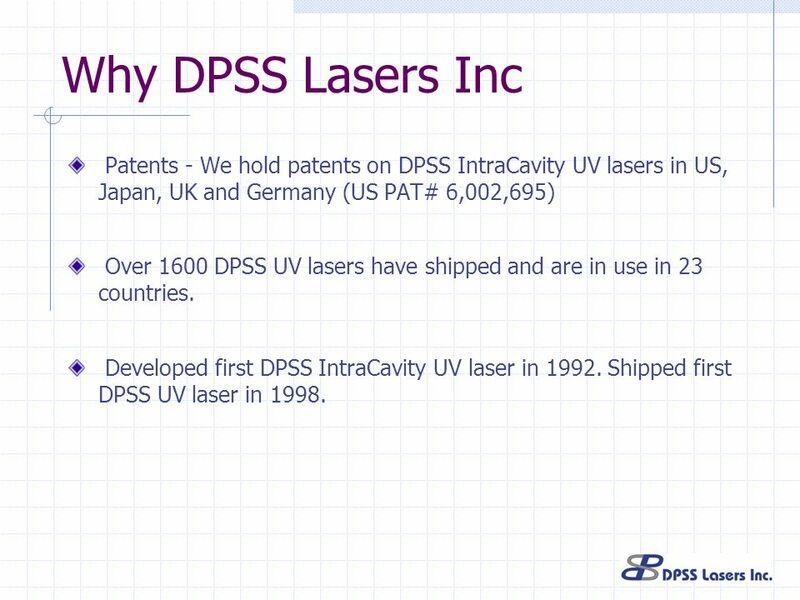 5 Why DPSS Lasers Inc Patents - We hold patents on DPSS IntraCavity UV lasers in US, Japan, UK and Germany (US PAT# 6,002,695) Over 1600 DPSS UV lasers have shipped and are in use in 23 countries. 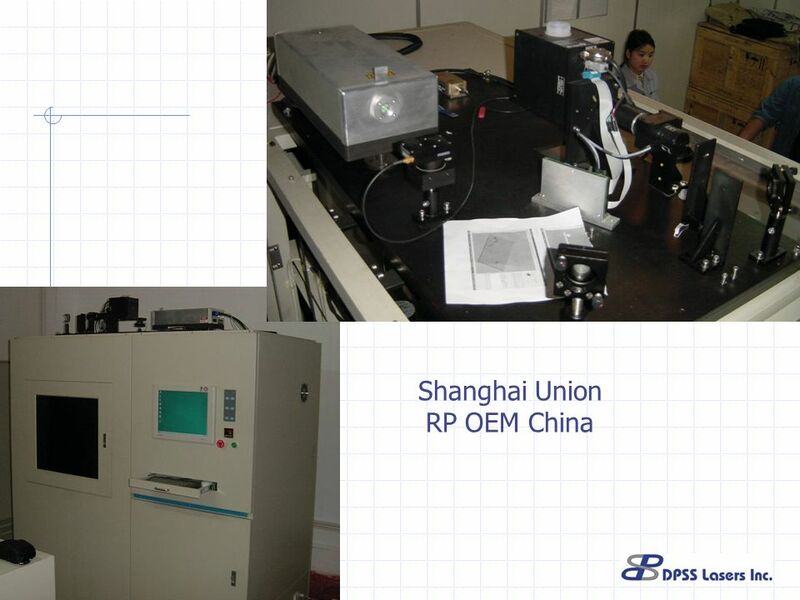 Developed first DPSS IntraCavity UV laser in Shipped first DPSS UV laser in 1998. 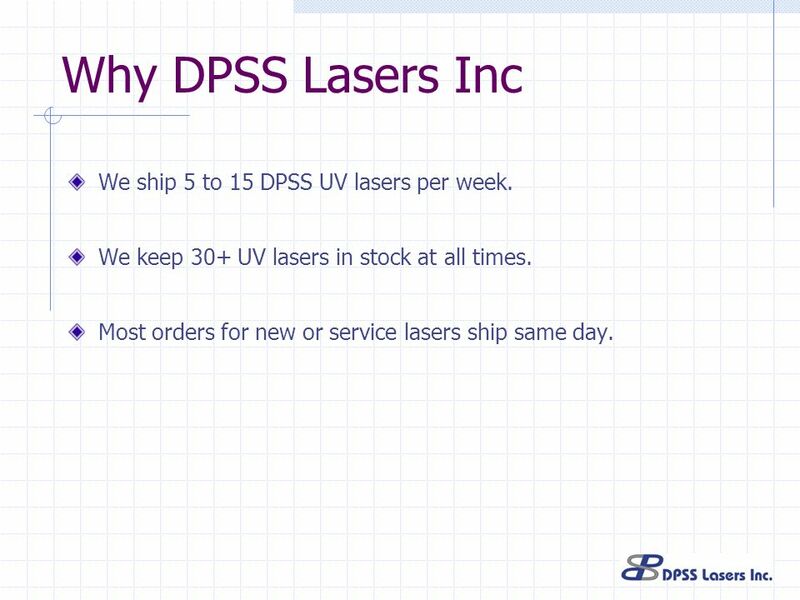 6 Why DPSS Lasers Inc We ship 5 to 15 DPSS UV lasers per week. 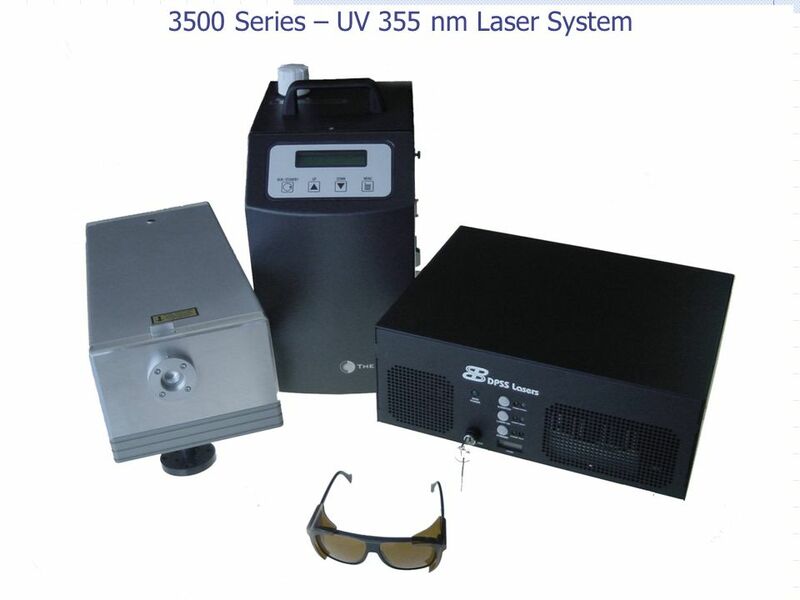 We keep 30+ UV lasers in stock at all times. 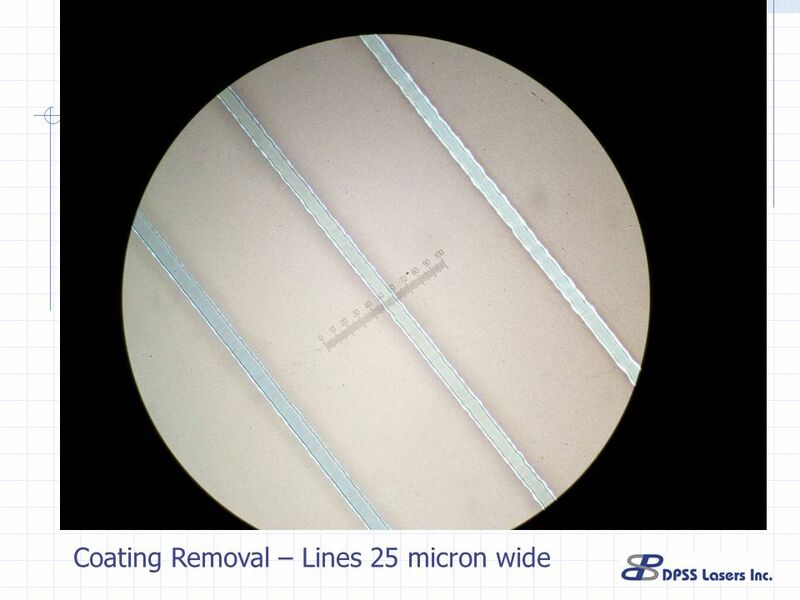 Most orders for new or service lasers ship same day. 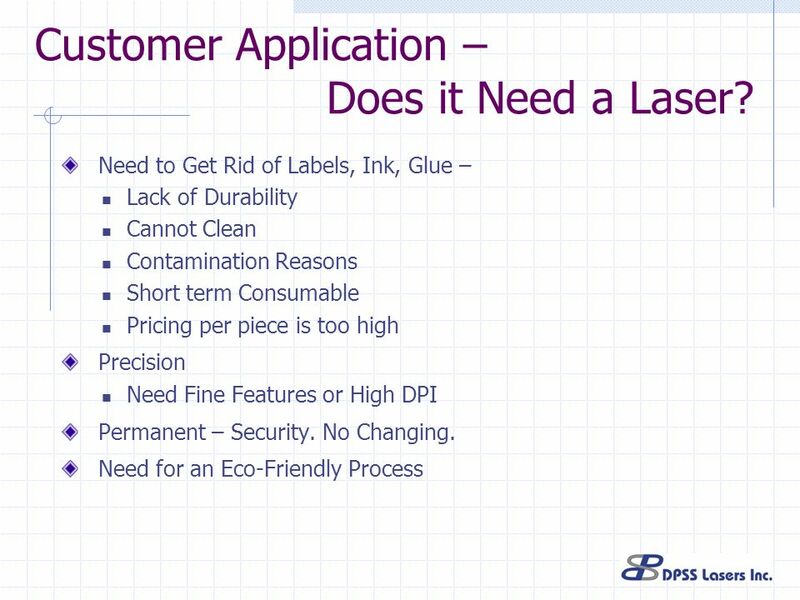 8 Customer Application – Does it Need a Laser? 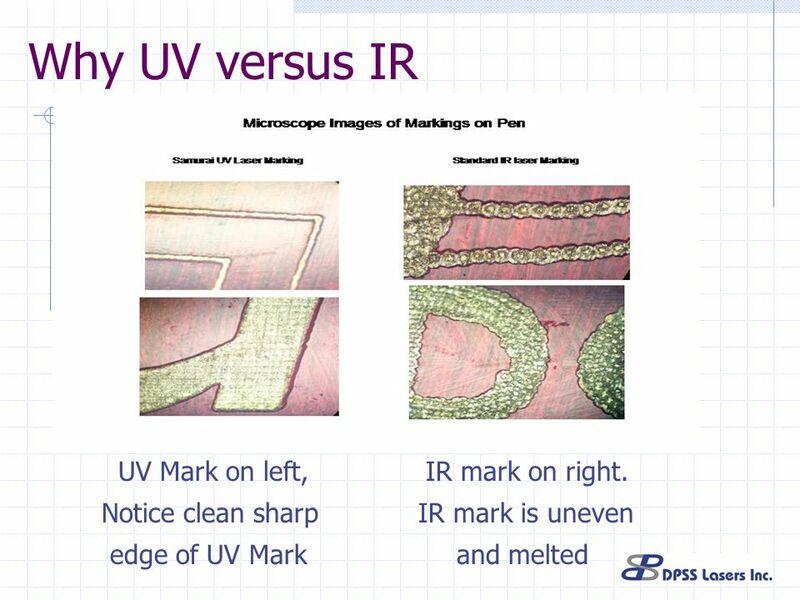 11 Why UV versus IR UV Mark on left, IR mark on right. 12 Will UV benefit my application? 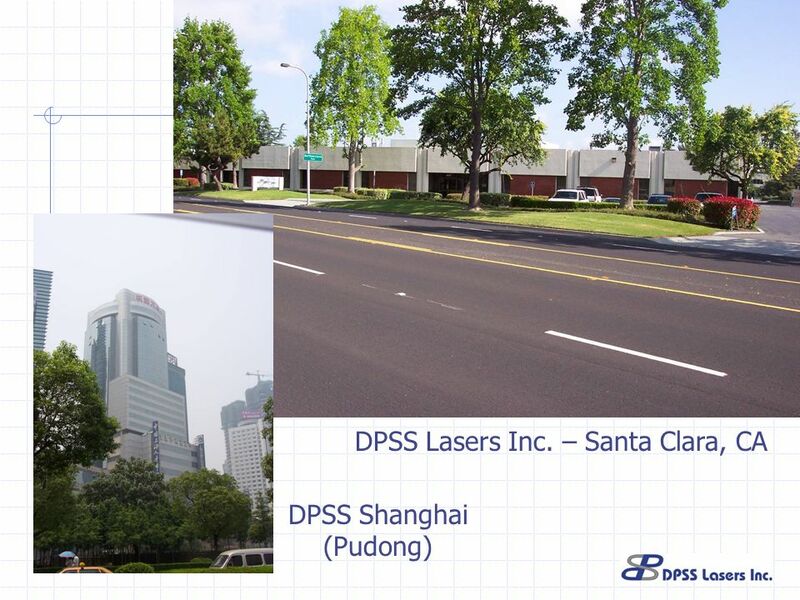 DPSS Lasers Inc has a free applications lab in Santa Clara CA. 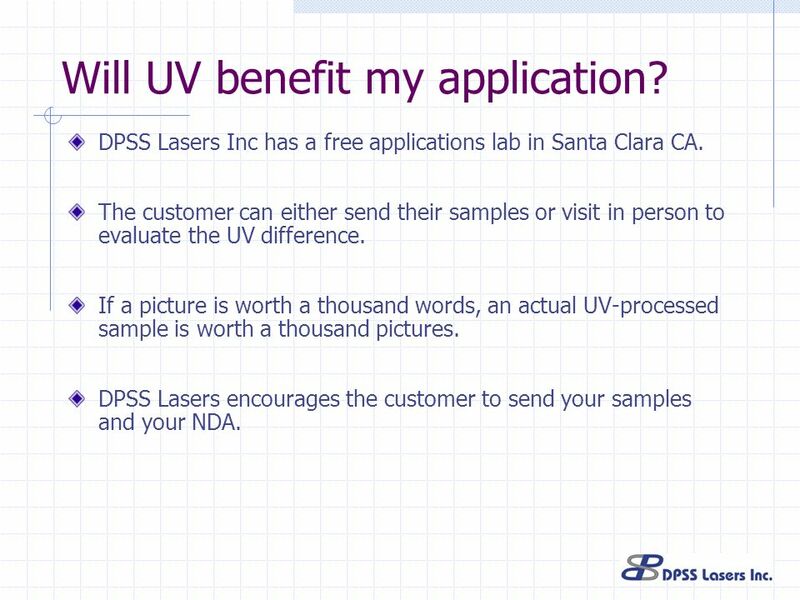 The customer can either send their samples or visit in person to evaluate the UV difference. 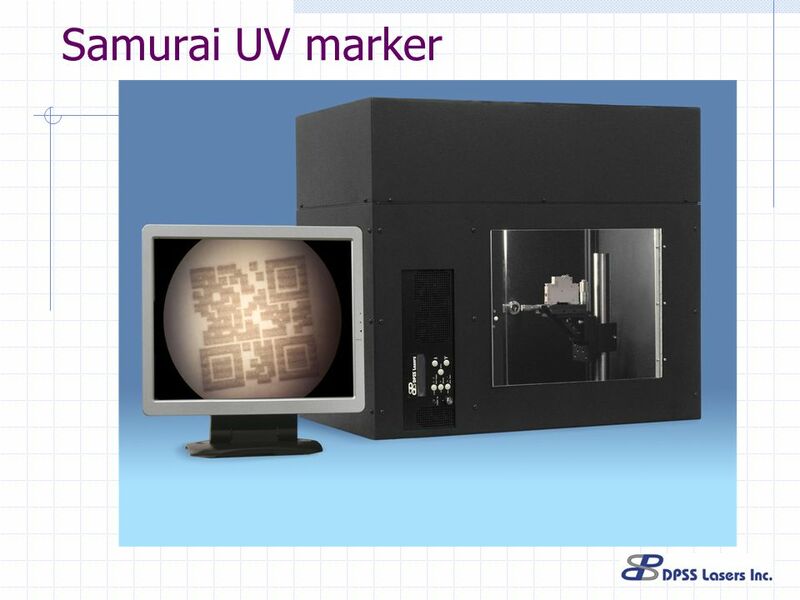 If a picture is worth a thousand words, an actual UV-processed sample is worth a thousand pictures. 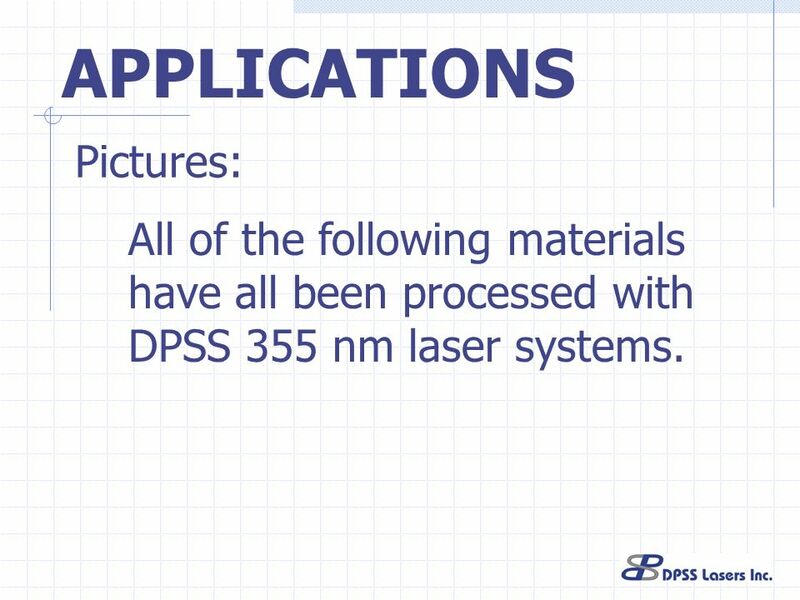 DPSS Lasers encourages the customer to send your samples and your NDA. 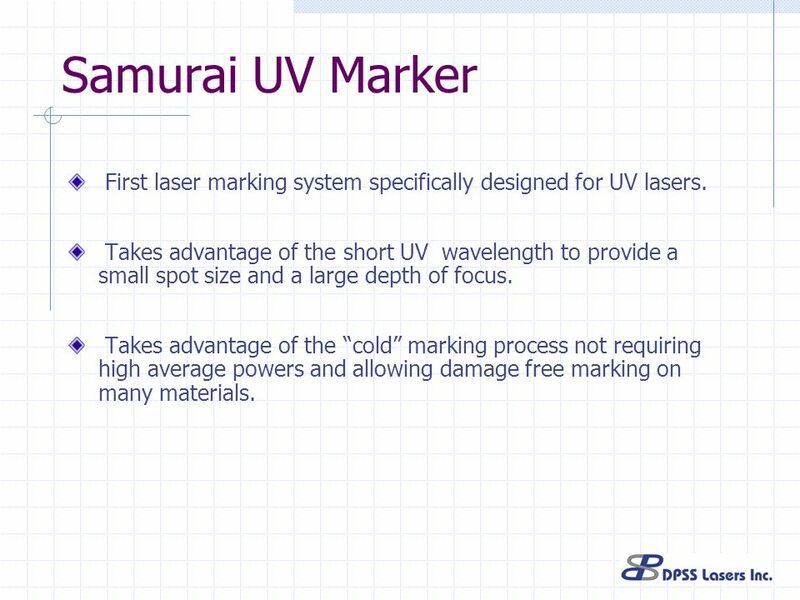 14 Samurai UV Marker First laser marking system specifically designed for UV lasers. 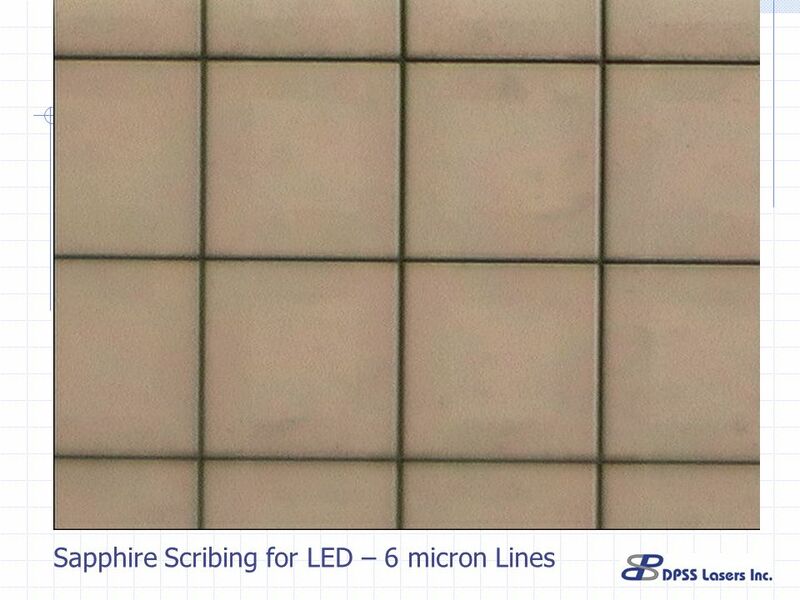 Takes advantage of the short UV wavelength to provide a small spot size and a large depth of focus. 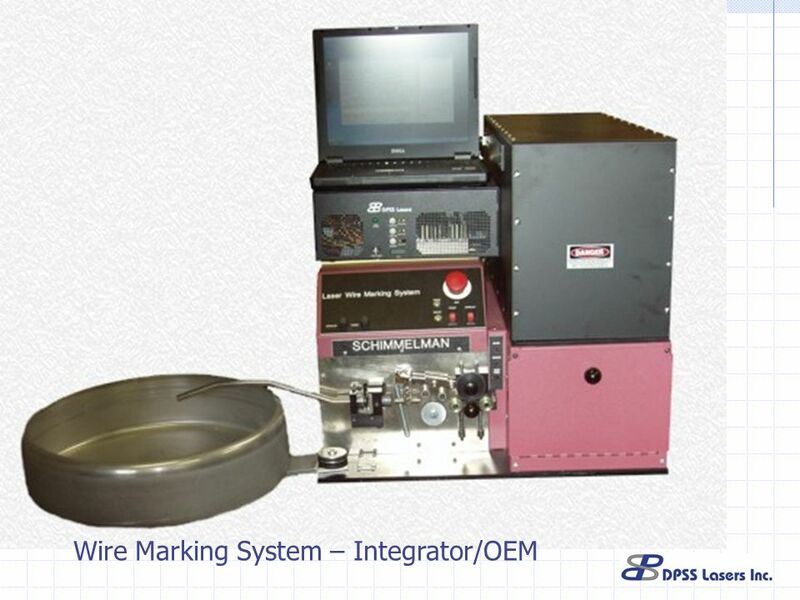 Takes advantage of the “cold” marking process not requiring high average powers and allowing damage free marking on many materials. 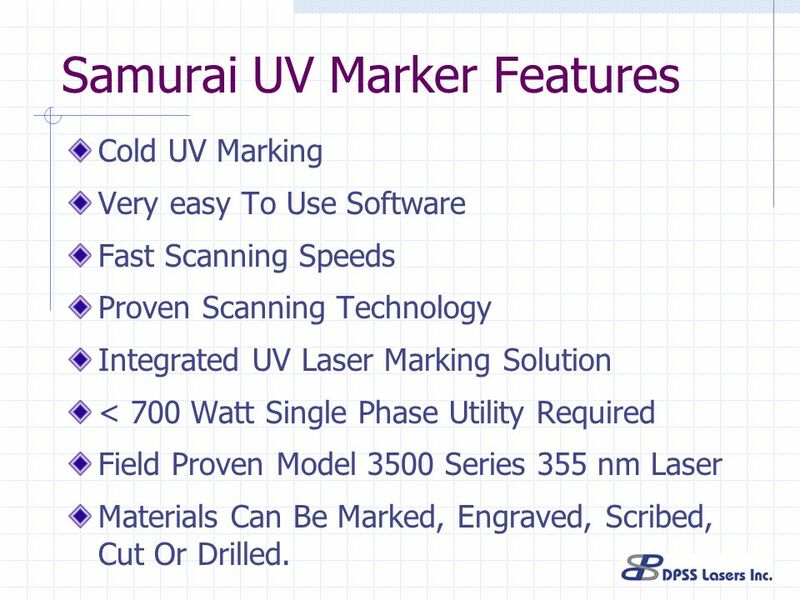 Cold UV Marking Very easy To Use Software Fast Scanning Speeds Proven Scanning Technology Integrated UV Laser Marking Solution < 700 Watt Single Phase Utility Required Field Proven Model 3500 Series 355 nm Laser Materials Can Be Marked, Engraved, Scribed, Cut Or Drilled. 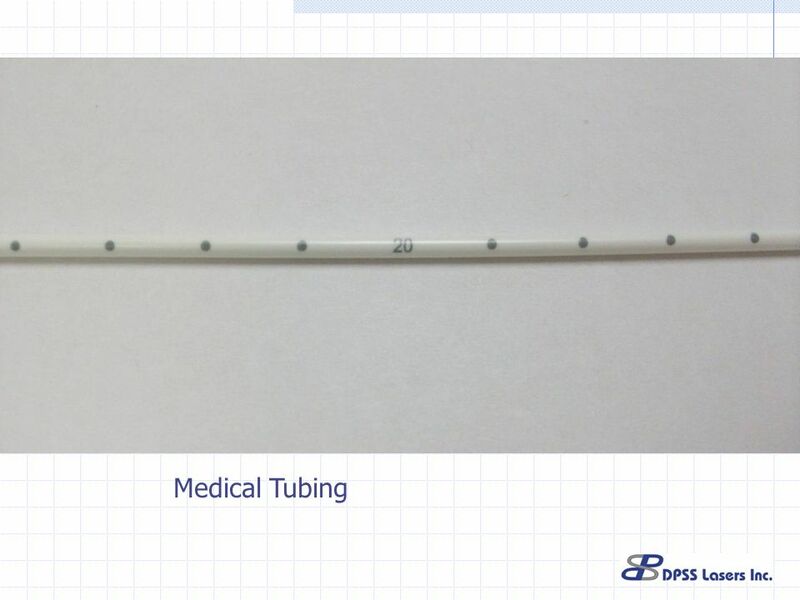 Medical Device Company 1 - Heart Implant Skiving insulation from 200 um wire for lead attachment. 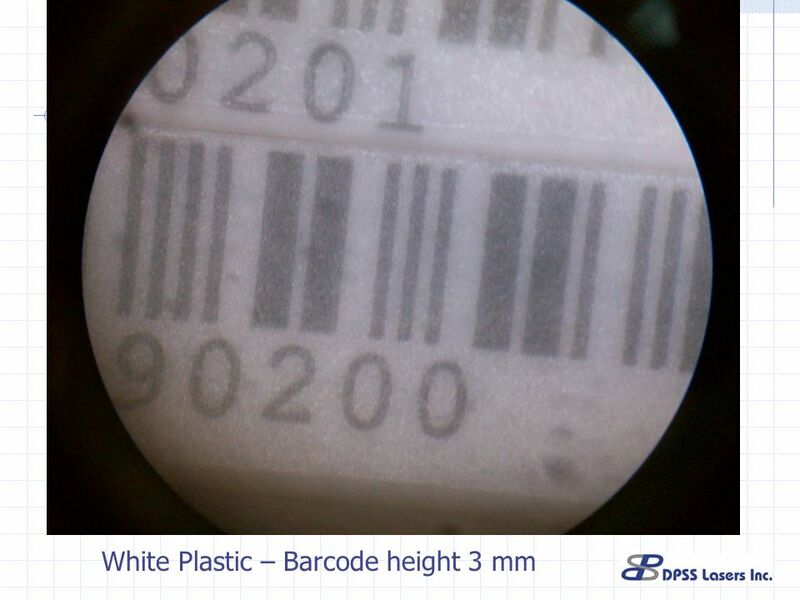 Medical Device Company 2 - Multiple systems Marking plastic devices Conventional printing and labels do not hold up to continuous cleaning. 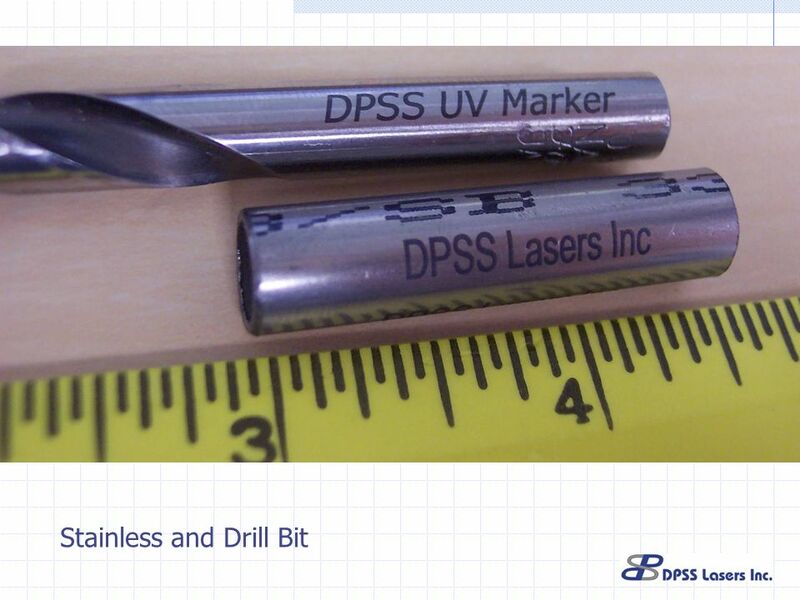 Energy Company – Fuel/Energy Cell production Drill tens of thousands of holes in thin membrane. 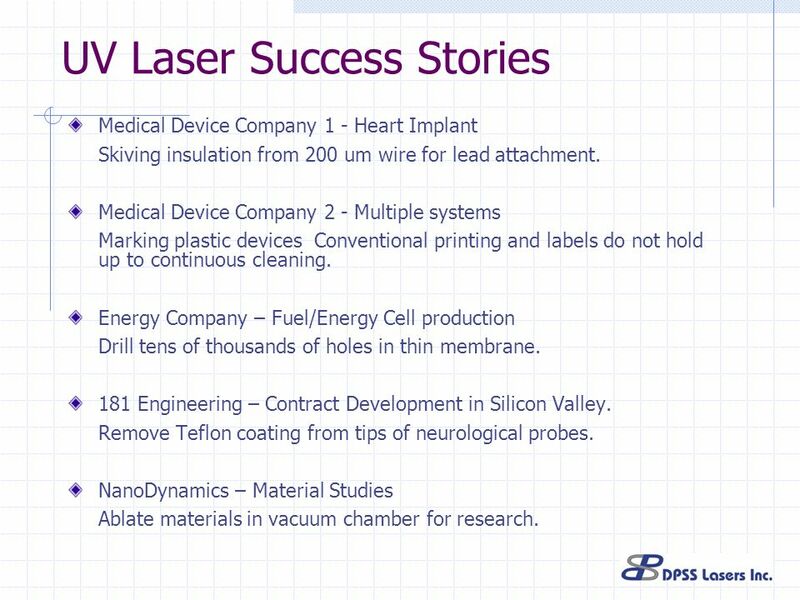 181 Engineering – Contract Development in Silicon Valley. 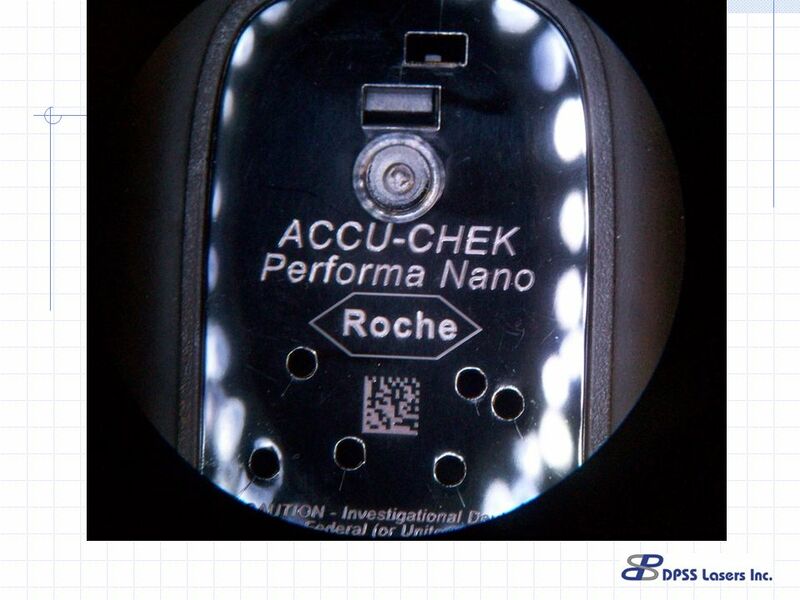 Remove Teflon coating from tips of neurological probes. 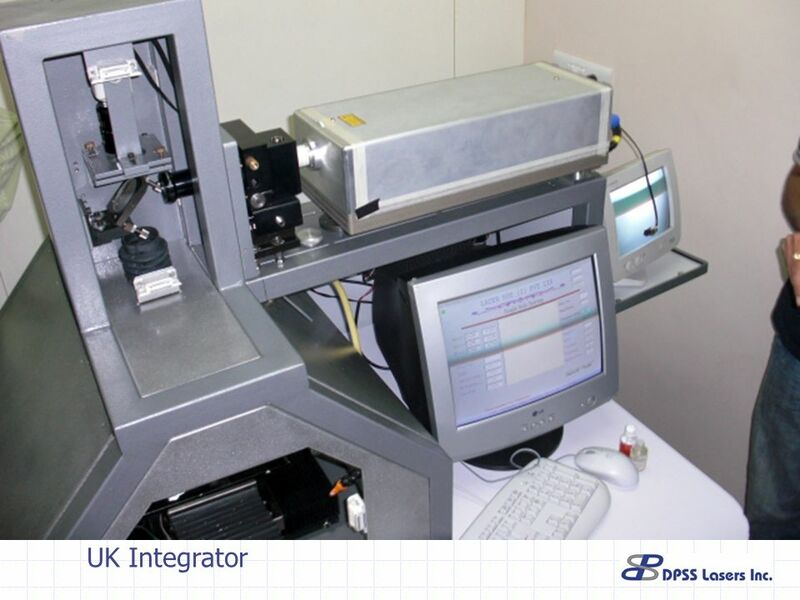 NanoDynamics – Material Studies Ablate materials in vacuum chamber for research. 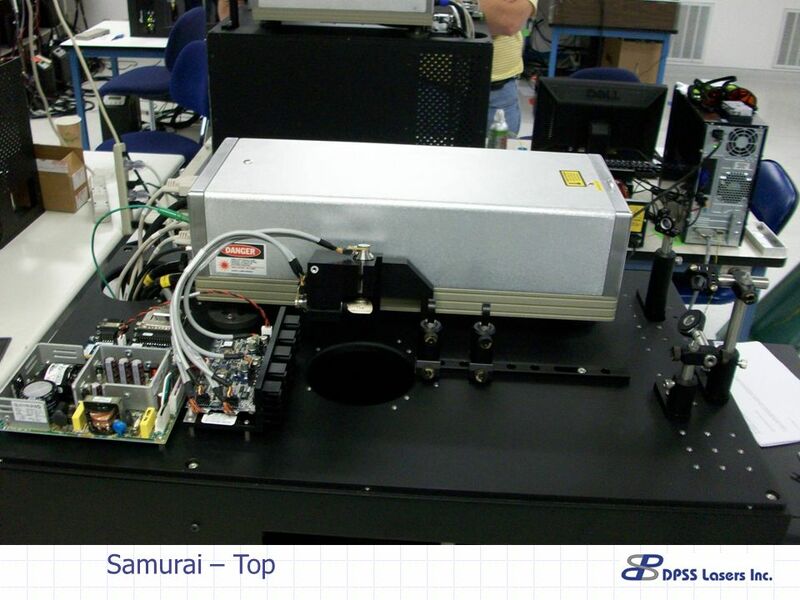 Company A - Major glass and film manufacturing Samurai base mounted over production line for making film on the fly. 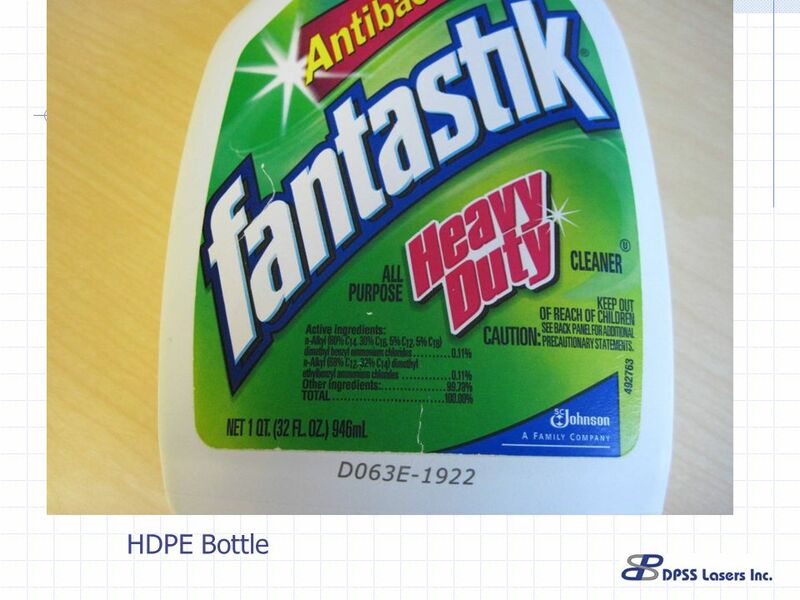 Gentex- Automotive application Remove thin-film metallic coatings from backside of rearview mirrors. 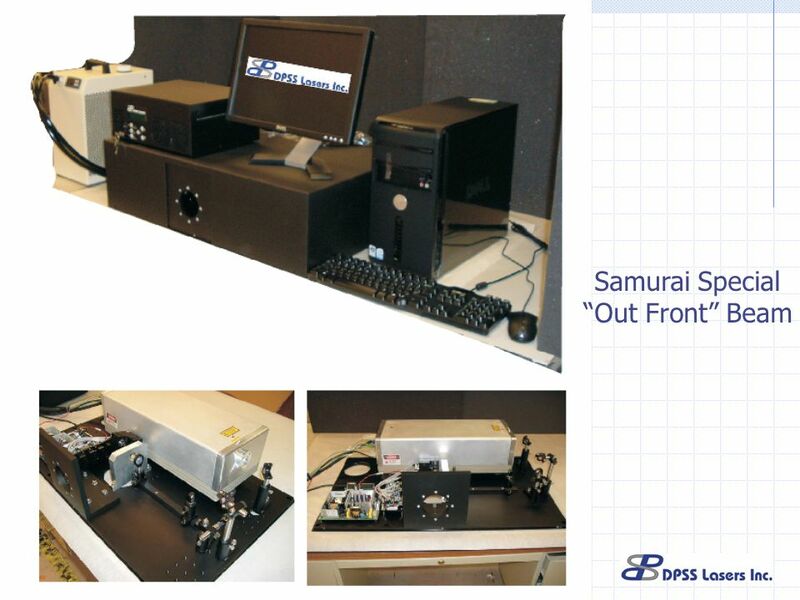 Medical Device Company 3 - Biomedical Implant Samurai to remove epoxy coating from contact leads of sub-millimeter device. 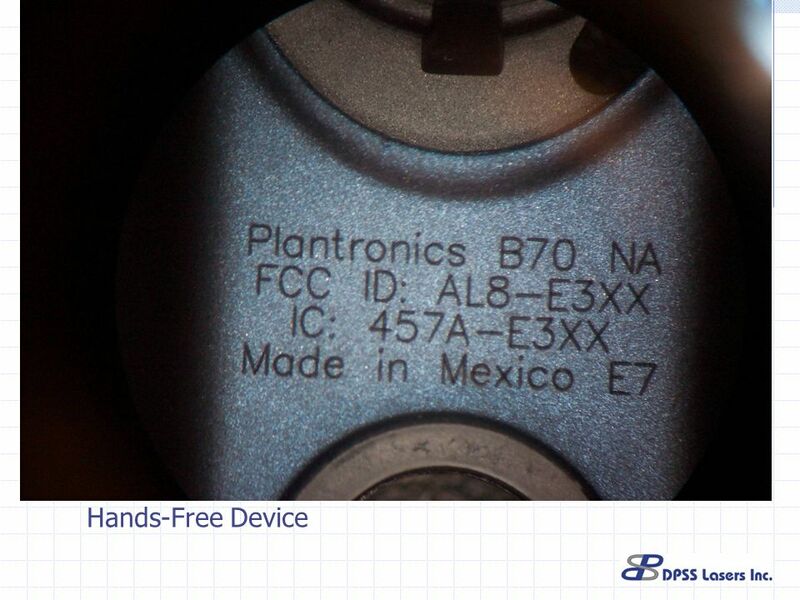 No damage to device. 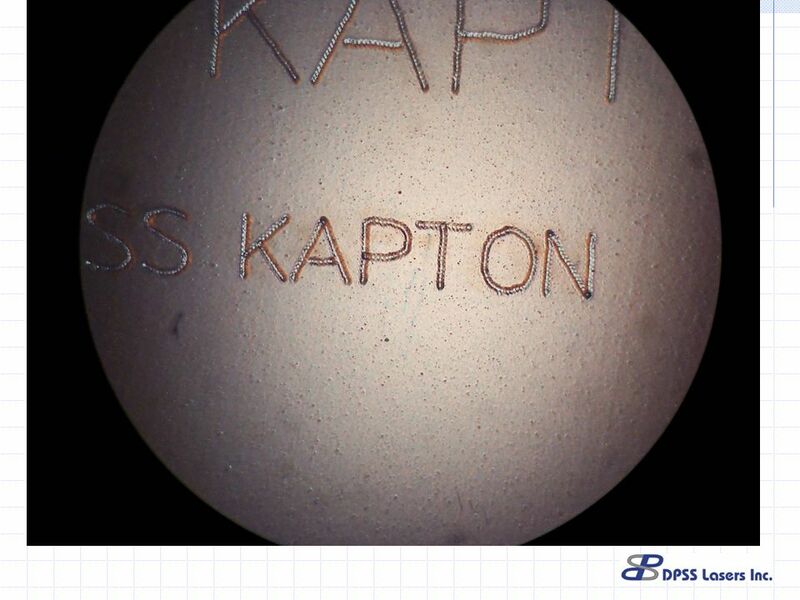 Wire marking for Commercial and Military Aircraft. 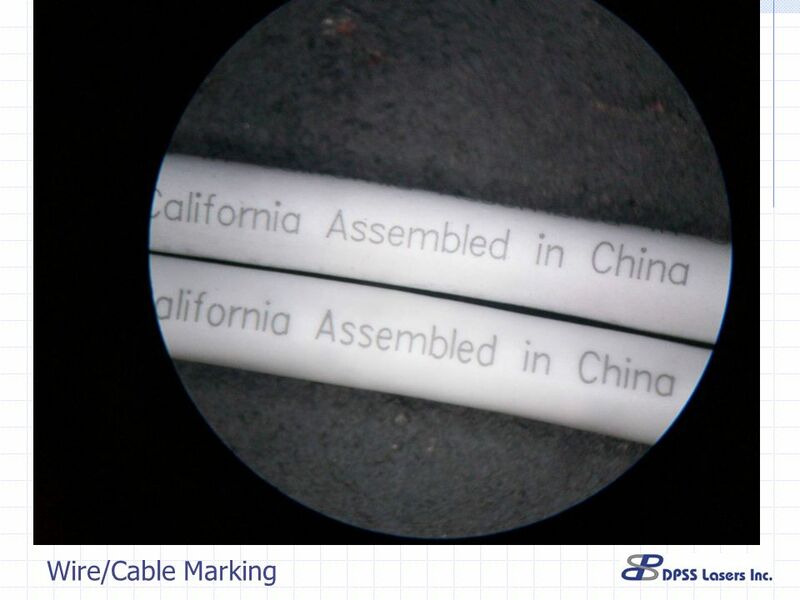 In spring of 2006, FAA mandated that all wires in M&C aircraft must be marked with UV laser or each mark must be tested and certified post process. 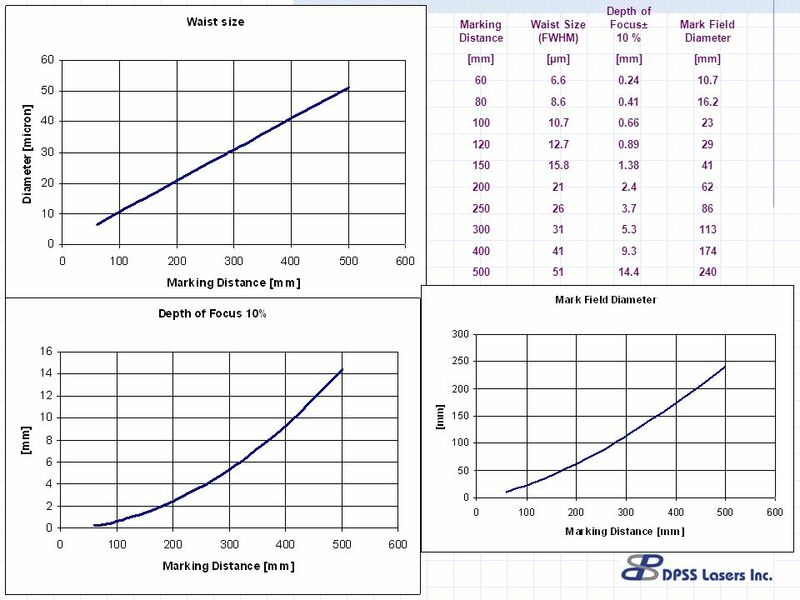 Permanent mark and no damage. 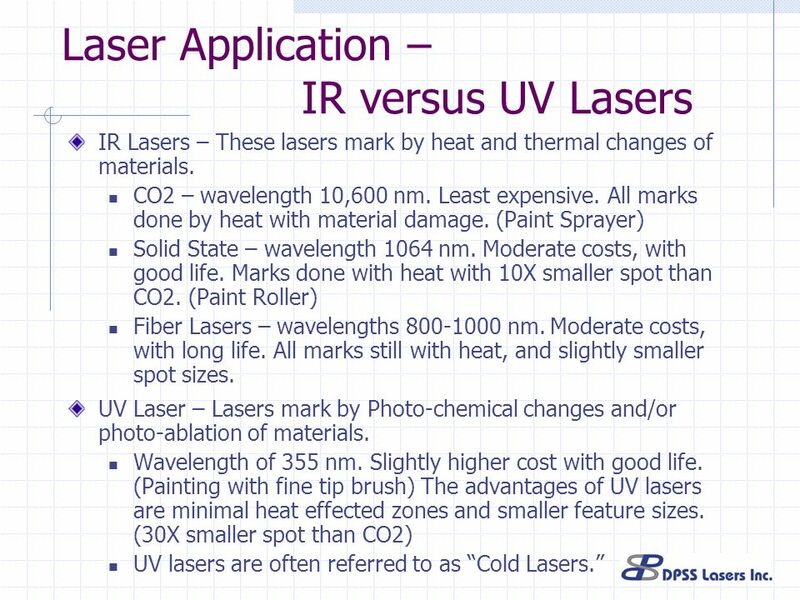 Worldwide Laser - Major cosmetic company switching over from CO2 to UV due to better and faster marking of many plastics. 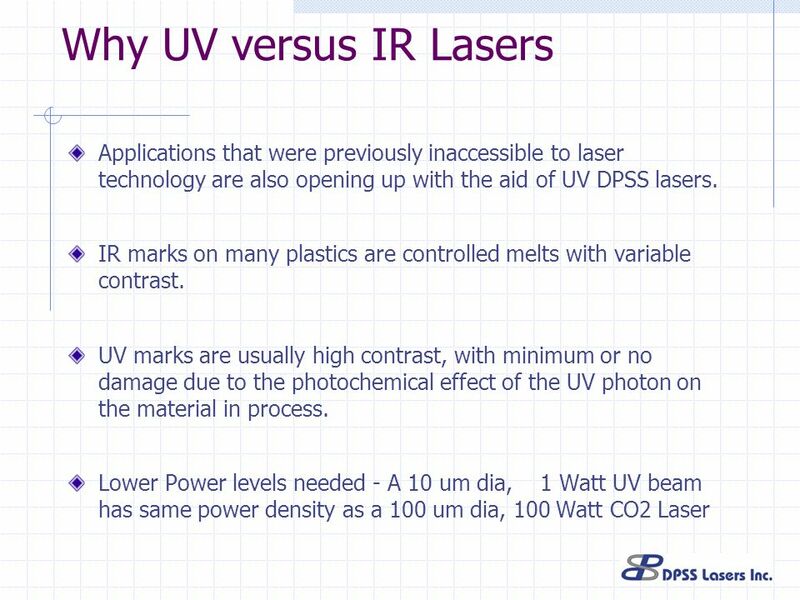 UV Beam – Cannot see, unless it hits something!! 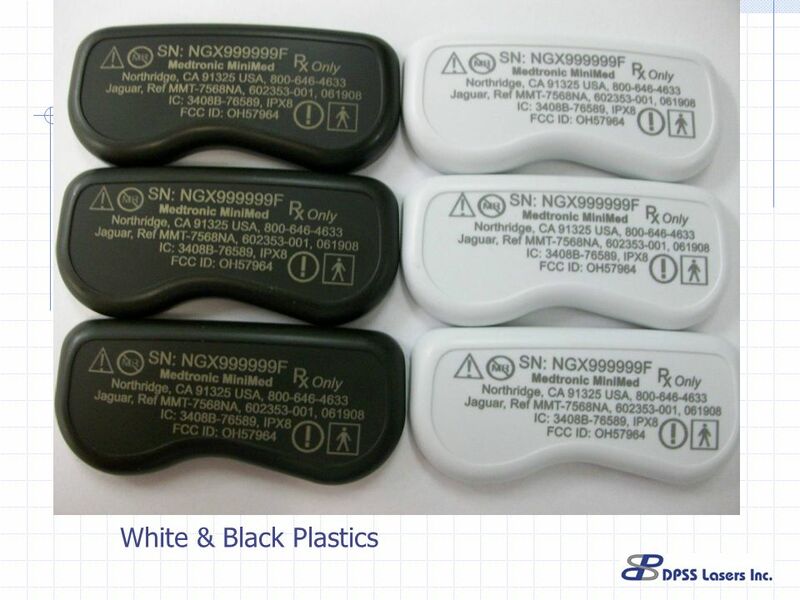 Wear Eye Protection – Yes Extra Care when wearing eye protection Skin Protection – Not needed. 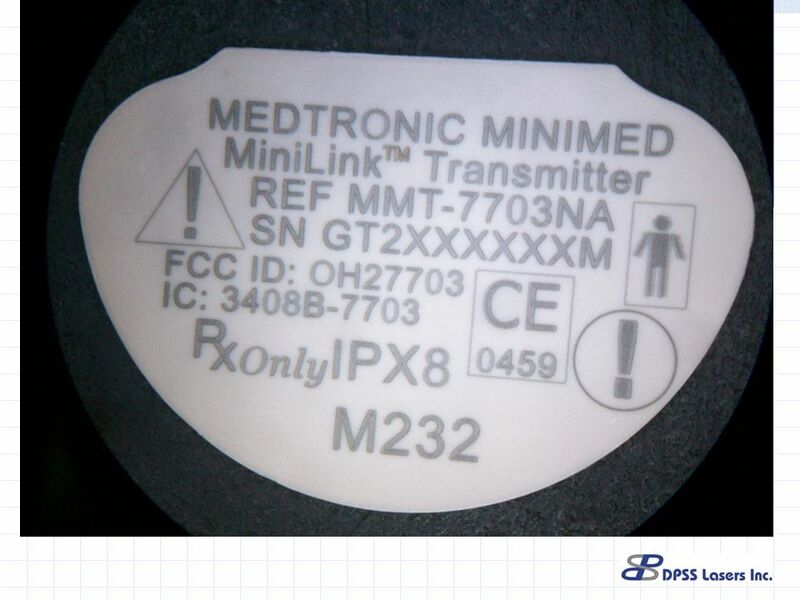 Electrical Safety – This is biggest risk. 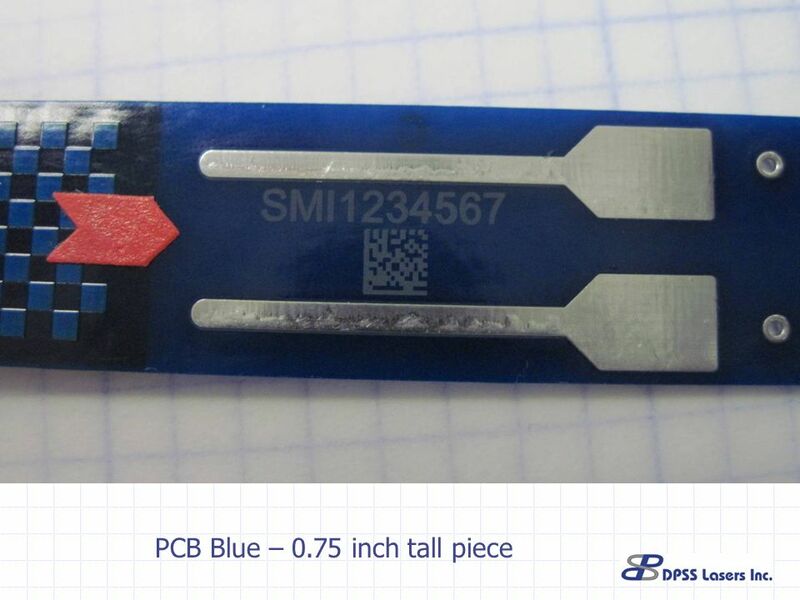 Solid State Lasers – Low voltage, high current. 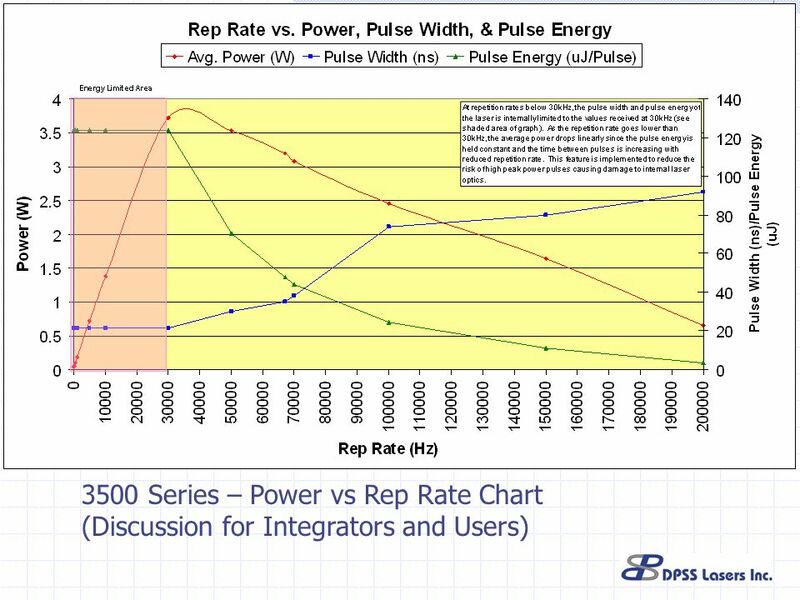 Less risky, but still up to 700 Watts. 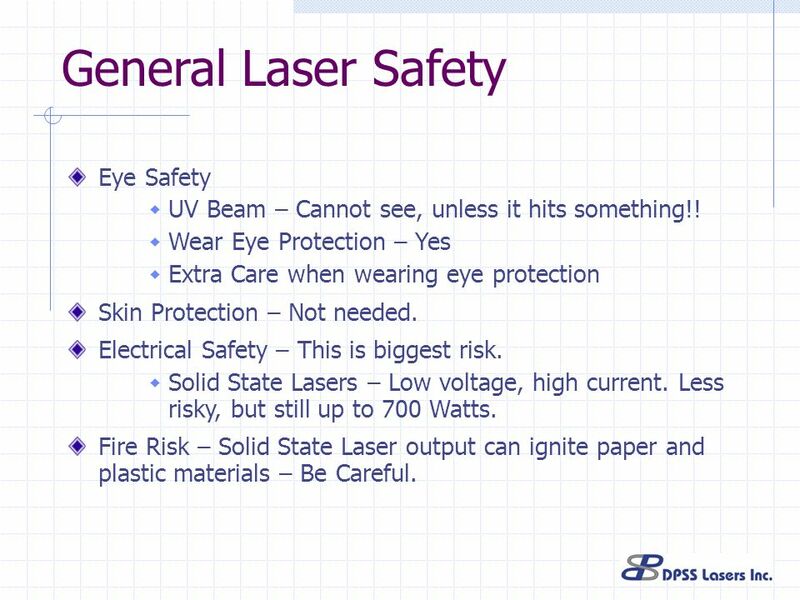 Fire Risk – Solid State Laser output can ignite paper and plastic materials – Be Careful. 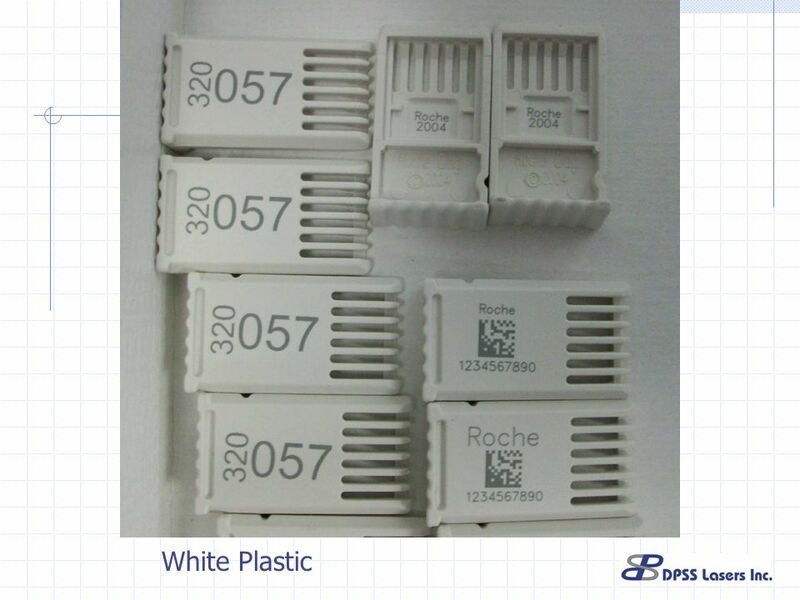 have all been processed with DPSS 355 nm laser systems. 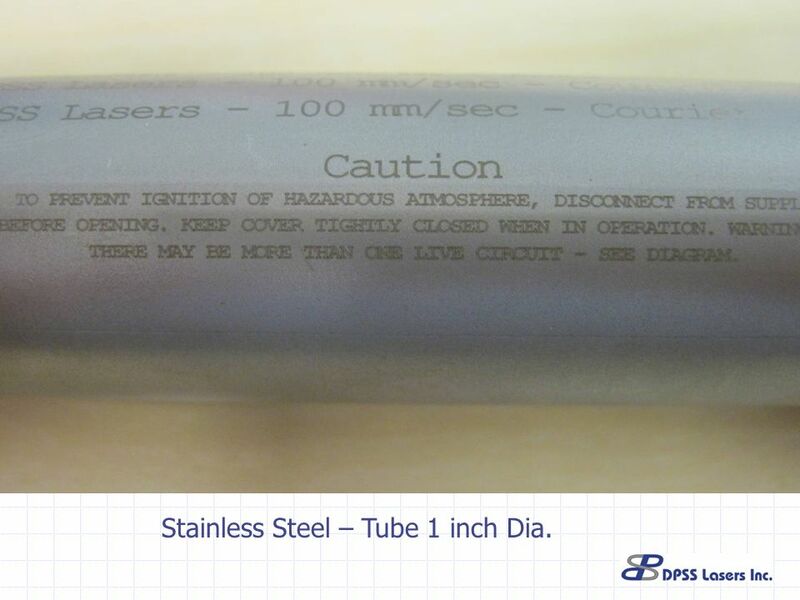 34 Stainless Steel – Tube 1 inch Dia. 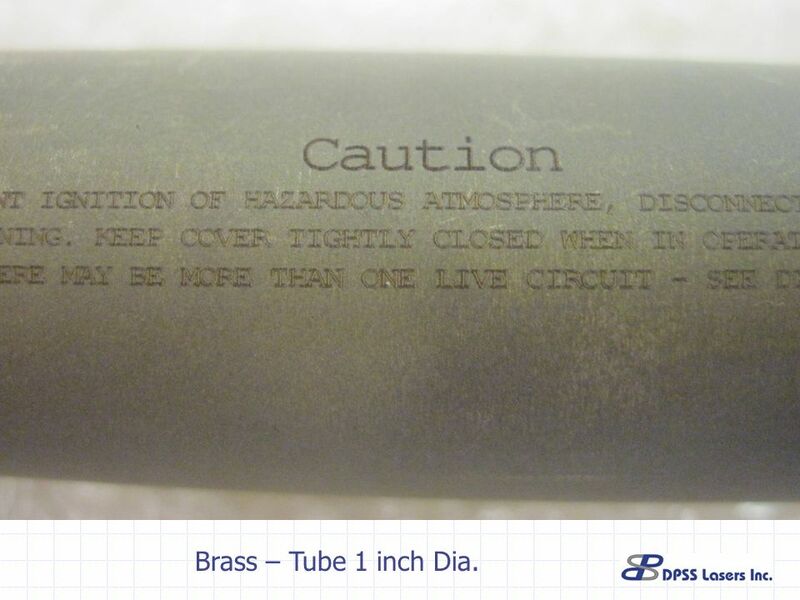 37 Brass – Tube 1 inch Dia. 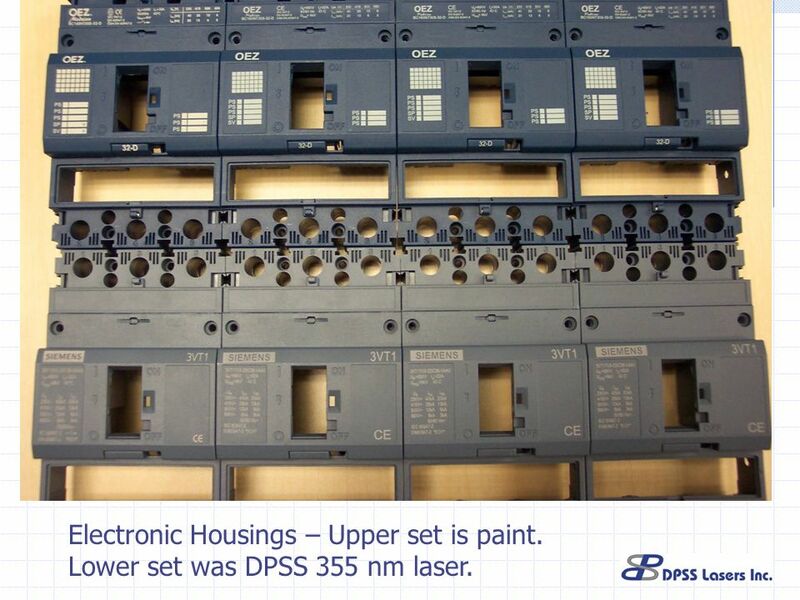 53 Electronic Housings – Upper set is paint. 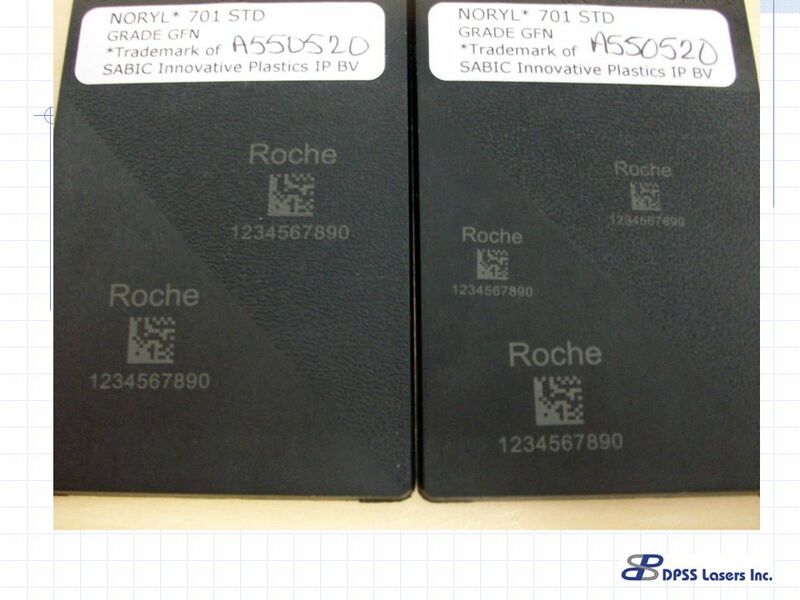 Lower set was DPSS 355 nm laser. 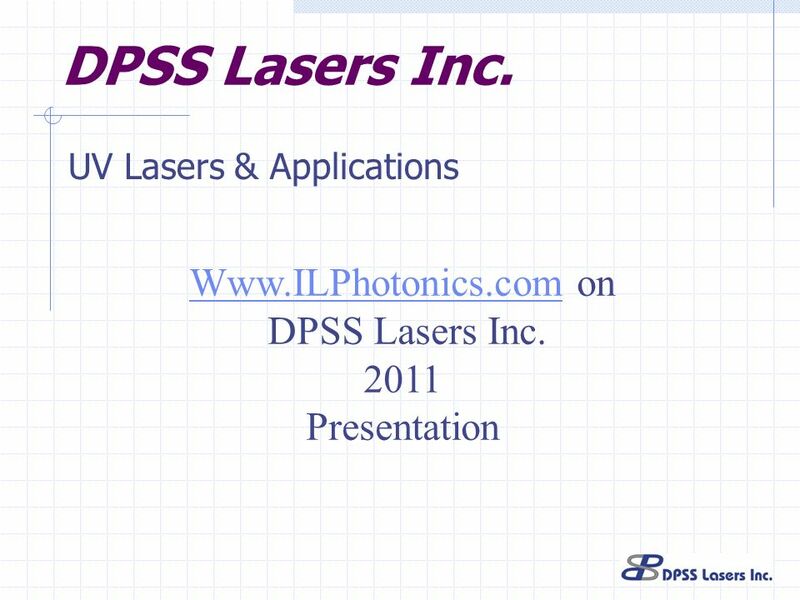 Download ppt "DPSS Lasers Inc. on DPSS Lasers Inc. 2011"
Diode UV Output Fiber M1 Nd:Van Q.S. 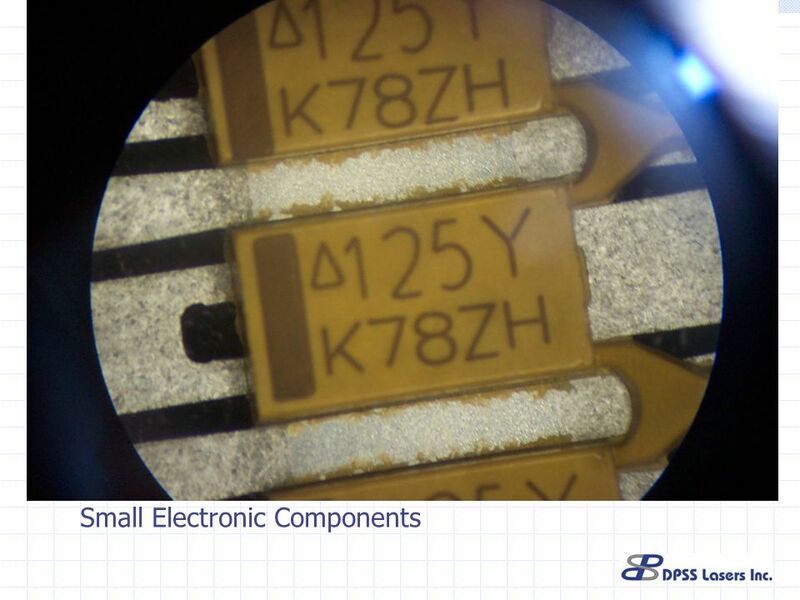 M2Lens SHGTHG UV Filter Diode UV Output M1 Nd:Van Q.S. 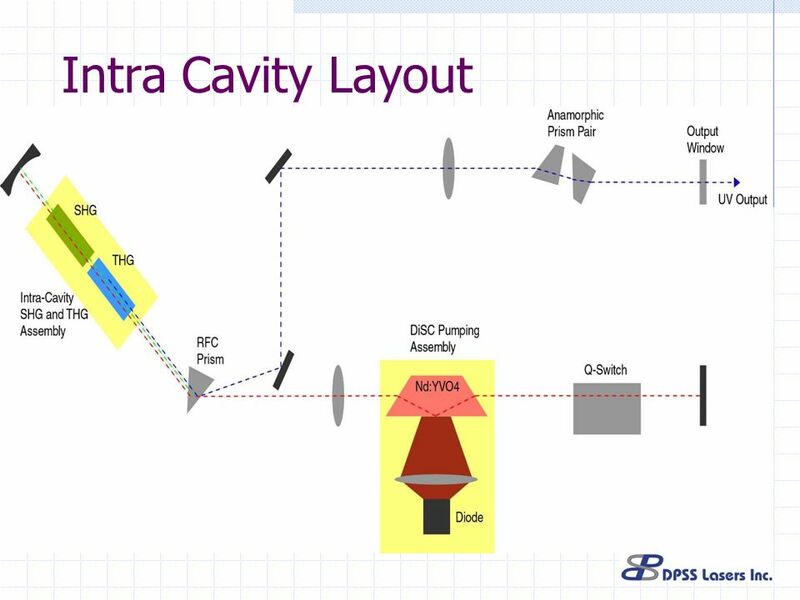 M2Lens SHGTHG Extracavity Intracavity Techniques for UV Tripling. The Presentation will begin shortly Click to Start. 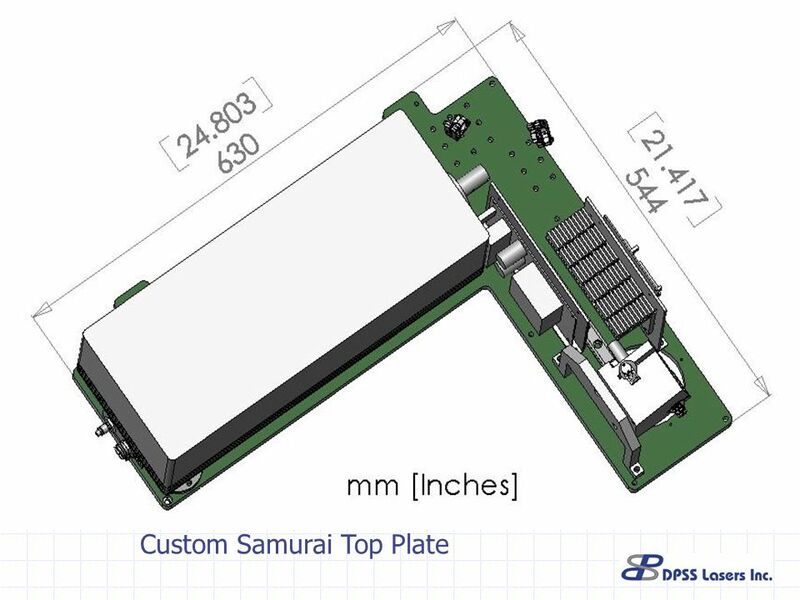 Sierra Proto Express Introducing our Micro Electronics Division. 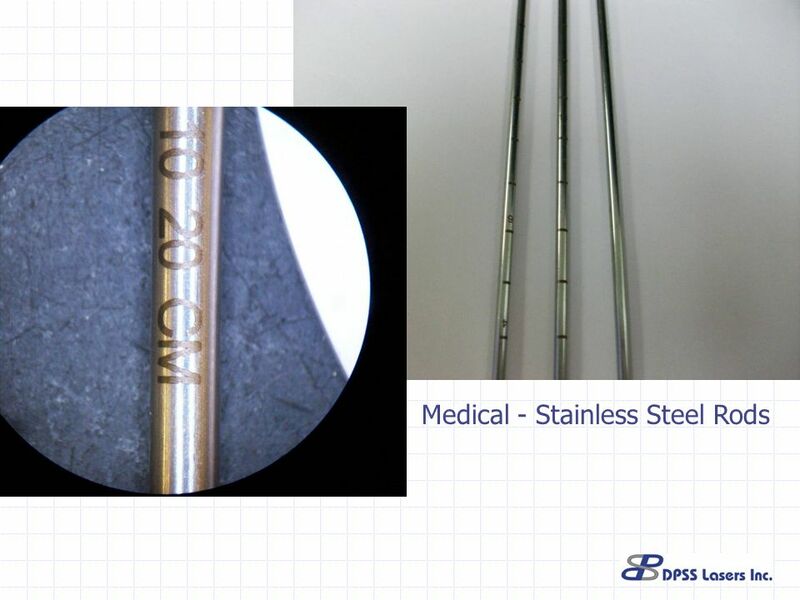 Lab Equipment. Beaker Beakers hold solids or liquids that will not release gases when reacted or are unlikely to splatter if stirred or heated. 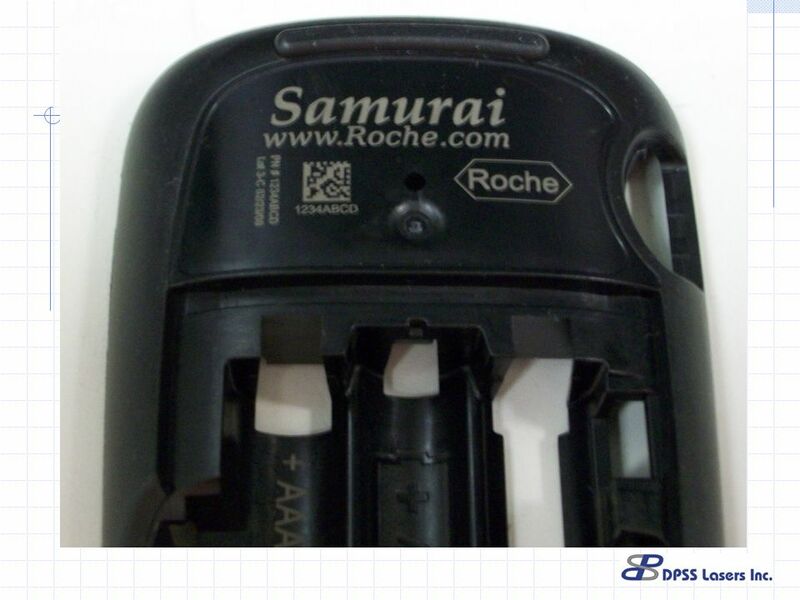 Ten Major Myths And Misrepresentations About Laser Printers And Toner Cartridges. 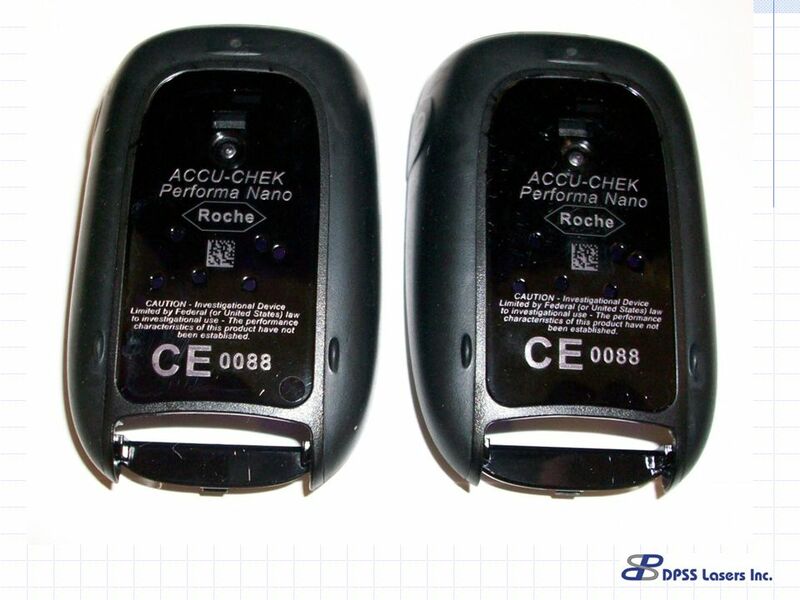 Safety / Intro The mains supply and batteries are sources of Electrical Energy Electrical Appliances are Energy Changers. 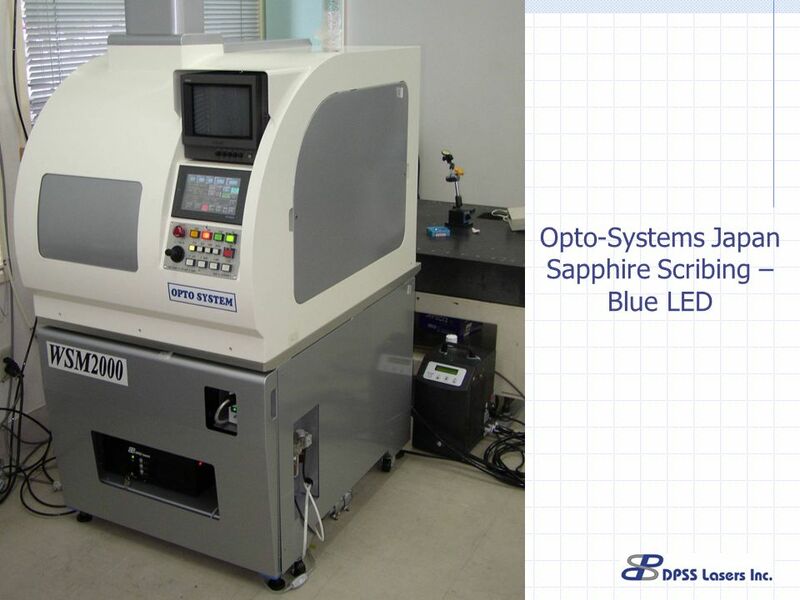 Photonics is recognized by the European Commission as one of the 6 Key Enabling Technologies. 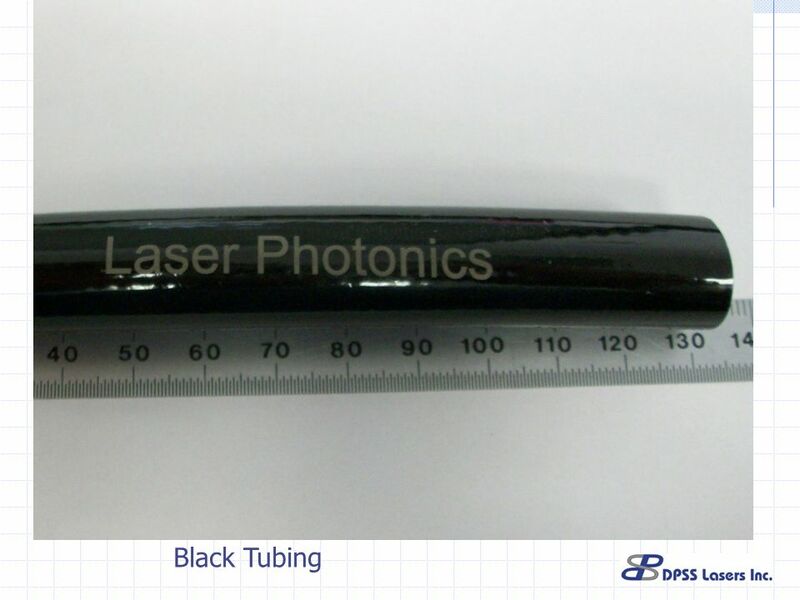 Photonic. 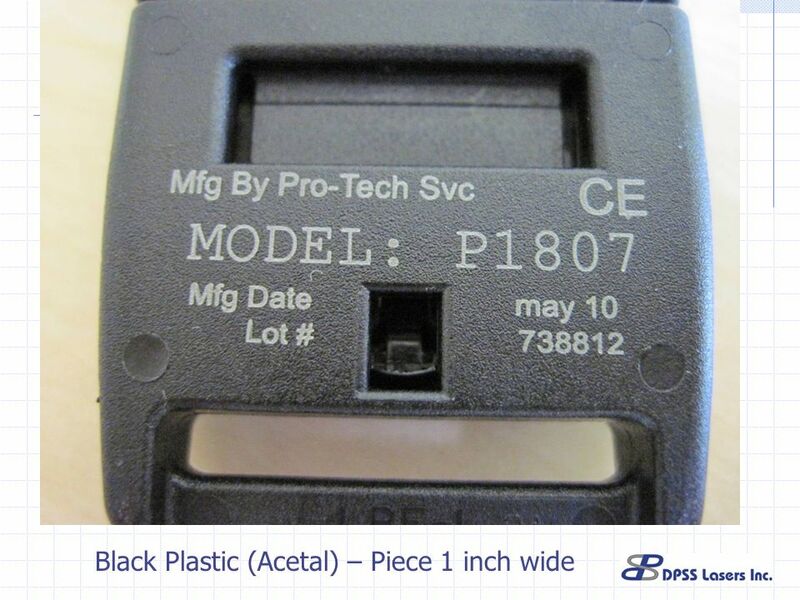 Lesson Using Construction Fasteners and Hardware. Five Objects x Five Materials YANGSEUB LIM. 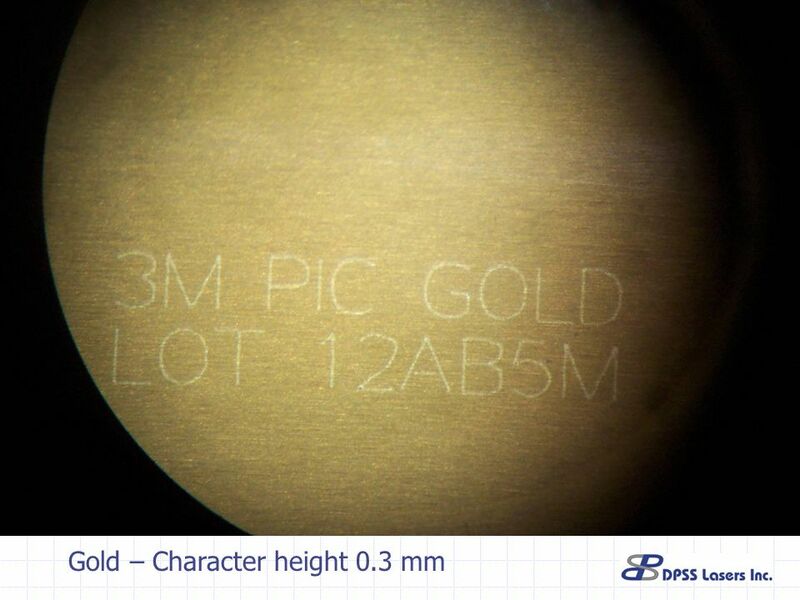 Le Ban Rose Gold Ring Material : 14k Rose Gold Plated Size : 2.786 x / 1.21 y /2.528 z (Cm) 1.097 x / 0.476.